What’s So Special About Alsace, France? 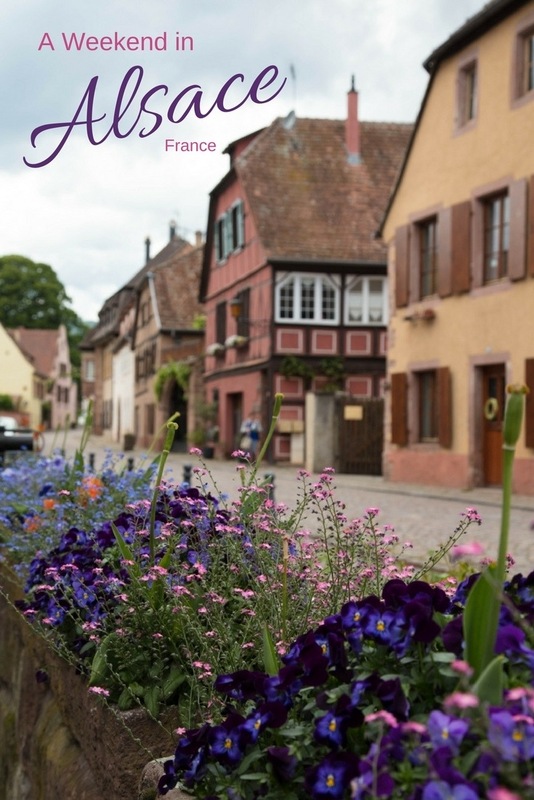 Your trip to France isn’t complete until you’ve visited the beautiful Alsace region. Driving along the 170 km Route des Vins (wine route) for at least a short stretch, say between Kaysersberg and Ribeauville, is a must. The charmingly quaint villages, fortified walled towns, hilltop castles, and glimmering green vineyards will transport you back in time. We finish work on Friday and hit the road as soon as possible, bags already packed the night before. Drive west along the German Autobahn as fast as traffic and road conditions will allow. Arrive sometime between 8 – 10 PM and have a small, late dinner and a welcoming glass of Alsatian cremant after checking in to our favorite hotel, Hostellerie Schwendi. Then, depending on the time of year, we’ll go for a stroll around the quiet, starlit village of Kientzheim. Why Kientzheim? 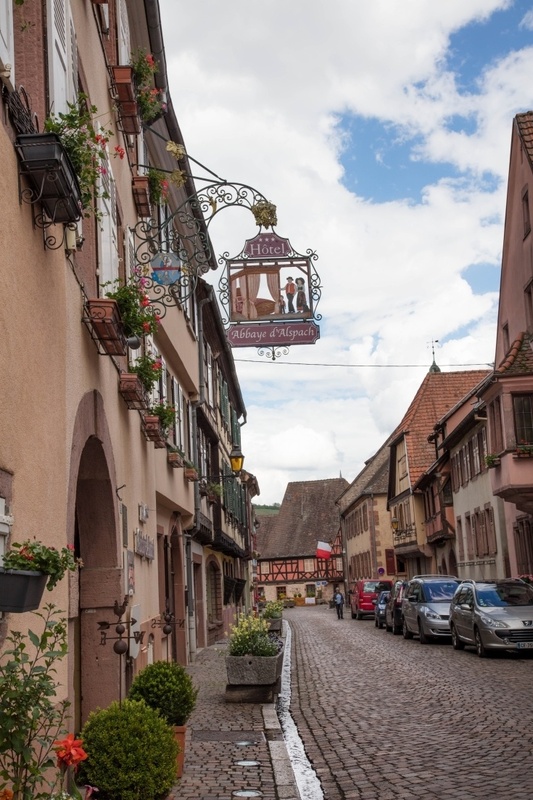 It is one of the prettiest, walled villages in Alsace but it’s still not overflowing with tourists and tourism businesses. This is a small, charming town with a beautiful fortified gate, a small chateau, two excellent restaurants, two boutique hotels, and several family run wineries. It makes the perfect base for exploring the region as it is directly on the Route Des Vins with several major attractions nearby. Waking up in the morning we hear the swallows chirping busily as they fly to and fro feeding their young or building their nests under the ancient wooden beams of a brightly painted half-timbered building. The air is fresh and clear as the sun rises and shines on the hillsides covered in a quilt-work pattern of acre upon acre of neatly arranged vineyards. After a delicious breakfast of local cheeses, meat, eggs, and baked goods (croissant, pain au chocolate, and perfectly baked bread) it’s time to go exploring. 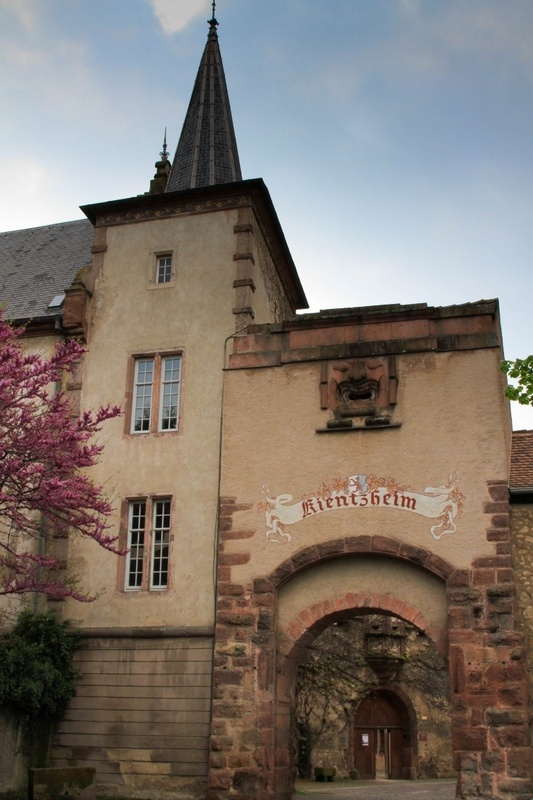 Kaysersberg is nearby and is one of the jewels of Alsace. Several ancient buildings, a beautiful cathedral and of course the ruins of a medieval fortress will take a few hours of our time. One of our favorite boulangerie/patisseries is here, L’enfariné, so we must stop in for a delicious cup of cafe au lait and a mouth watering mille feuille. 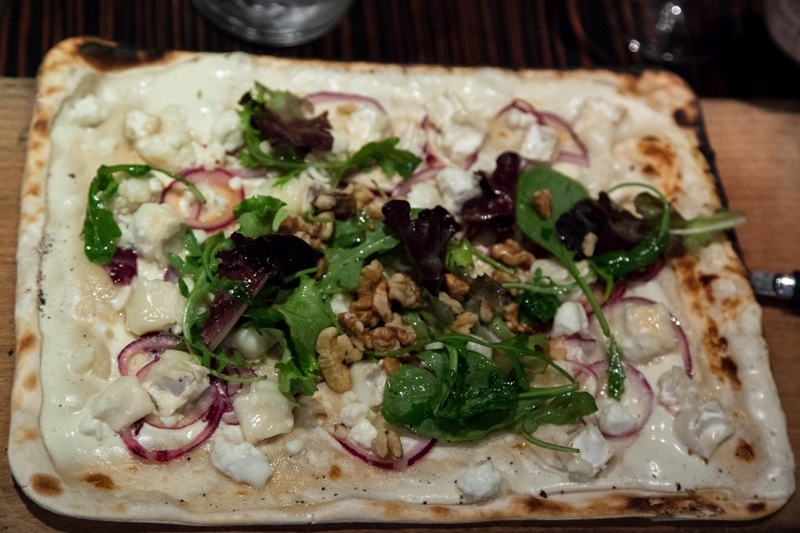 Or, if it is later in the day, we’ll stop for a light lunch of flammkuchen at Flamme & Co; I recommend the Chèvre Miel with goat’s cheese, honey, walnuts, and onions–perfect! Stop in the Flamme & Co for an amazing flammkuchen! After lunch it’s time for some shopping. Yes, there are plenty of shops with regional artisanal products such as ceramics, knitted items, wood carvings, and other souvenirs, but for us, one of the main reasons for these French pilgrimages is the wine, cheese, and french gourmand groceries. Our Saturday afternoon always involves a stop at Cora, a French mega-supermarket chain. It is fun to wander the aisles, check out the bakery, cheese counter, deli meats, sea food, and, of course, the wine selection. We’ll stock up on some favorites and pick out a few new things to take home. By now it’s time to go for a walk in the Vosges mountains along one of the well maintained hiking trails, do some backroads driving in the vineyards, or explore a new village on the route. Regardless, we need to be back in Kientzheim with enough time to change and get ready for our reservation for dinner at the Schwendi. I know there are other excellent restaurants to try, but I just can’t bear to pass by my favorite meal, Truite soufflée aux légumes et braisée au Riesling (the perfect trout dish), and another glass of their fabulous homemade wine. If we can’t get into one of the two hotels in Kientzheim, our next choice is Colmar. Colmar is a small city on the Route des Vins with one of the best preserved medieval centers. It is convenient for our visit to Cora and packed full of gourmet restaurants, wine bars, markets, and festivals. 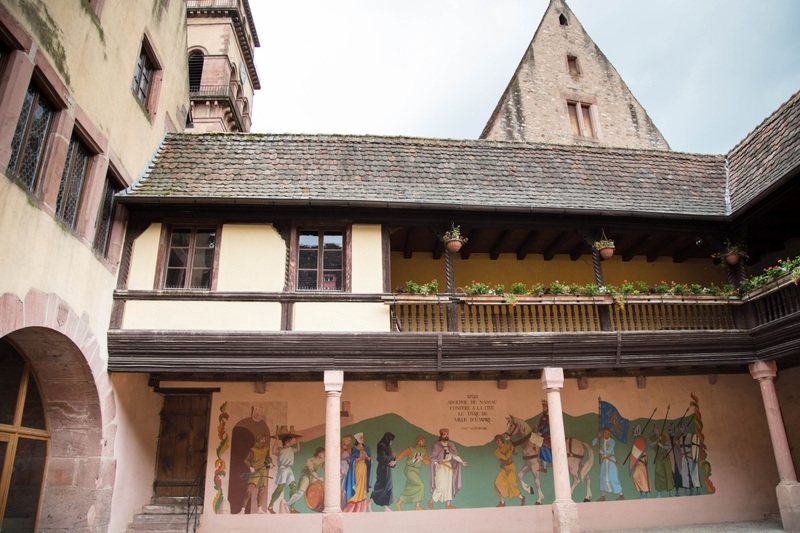 Plan you’re Route des Vins journey with starting or ending at one of these comfortable Colmar hotels. Sunday is all about slowly heading home, maybe stopping at another boulangerie or patisseri to pick up some treats for the ride. Perhaps we’ll stumble upon a farmers market, wine festival, Spring festival, Marche Gourmand, or other special happening. There is something happening every weekend somewhere in Alsace and we have loved every single one of them. Wouldn’t you just love to have a recharge weekend in Alsace? Pin your romantic weekend getaway to Alsace, France for later! Kientzheim is a very cute town. The food sounds wonderful and the sights outstanding. Rhonda, You would absolutely love it. We can’t wait to go back over and over again. It’s so charming and beautiful. 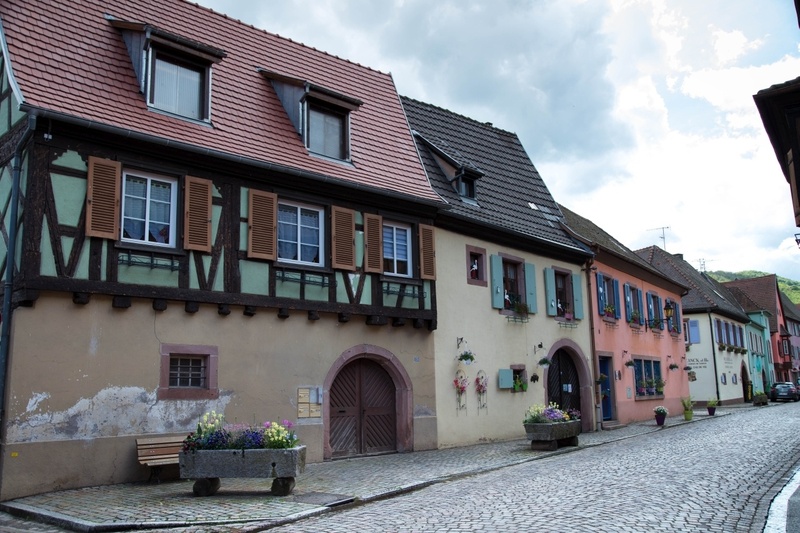 Sounds like a lovely weekend and place to recharge 😉 I have fond memories of staying in Kaysersberg several years ago and would love to return to the Alsace region! Jess, If you’ve been to Kaysersberg you know how quiet, charming it is. We love it. The food is amazing! Just adorable! The photos remind me of Beauty and the Beast 🙂 Can you get along alright without knowing much French? Briana, Everybody speaks English, German, and French. It’s no problem getting around at all. You should go! Sigh – so jealous of Europe-based travellers, being able to visit so many countries relatively easily!! Jane, It is very convenient…and you’ll never hear my complain! Yes it is, Shere! Yes it is! Alsace is one of those places that you hear little about, and I’m not sure why! It looks wonderful! I actually have a few ancestors from Alsace-Lorraine (which I believe used to be its own nation? ), but they were German speakers. I’ve had an interest in the region due to that- would love to get to go one day. Oh, You should definitely go! It’s amazing. If I had relatives there, they might never get rid of me. Alsace looks so charming! I would love to explore more of France and practice my French. Thanks for sharing! It’s a wonderful weekend, and people are so happy when you try to speak French. What a beautiful place! I love the fact that it’s not littered with too many tourists or businesses. That castle in the video looks so magical, too! I would love to get lost in one! There are a few of these smaller towns and villages along the Route des Vins that aren’t over run while others are quite crowded. Love, love, LOVE the drone footage. looks like a beautiful place – can’t wait to go to France! Thanks Crystal, you’re going to love France! There is plenty of WWII history in the area to be sure! I think just about every town has a memorial of some type or another. Does Alsace feel more French or German at this point? I’d imagine mostly French since the area hasn’t been German in almost 100 years, but I imagine there is a lingering sense of German culture. Josh, It’s definitely more French, but you are right…you can’t mistake a little German too. We absolutely love it! Yes, I would like to recharge in Alsace! Kientzheim looks pretty amazing! Sarah, It is pretty amazing! Looks wonderful! 🙂 It definitely has a small town charm – makes you want to walk around without map just to see what you’d find. Arimo, Yes, no map necessary. It’s so small, easily walkable. Sounds wonderful. It must be lovely to be close enough to return and have favourite places to stay and meals to eat. Yessss. Jan, It really is at least as long as we live here, maybe one more year. Thanks Hatton. We agree, that’s why we keep going back. I loved my brief visit to Alsace when I visited Strasbourg a few years ago. 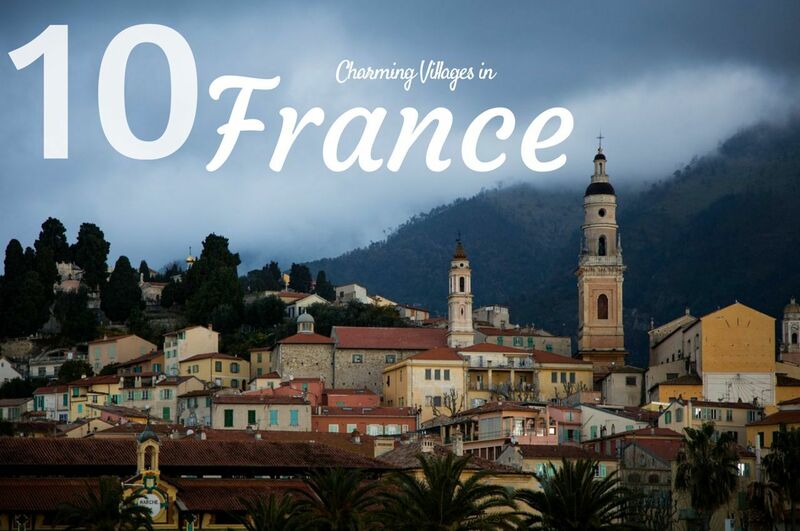 It seems to be home to some of the most beautiful towns in France, ie. Colmar and clearly Kientzheim. The fact that it’s a walled town is just an added bonus, I love walled towns. That video you have there is captivating too! Thanks for hosting. Yes! The entire region is filled with beautiful village after beautiful village. I just can’t get enough of it. Glad you enjoyed it while you were there! We will be visiting the Alsace region next month and this post made me even more excited of that day trip. We’ll be in Colmar and looking forward to all the attractions and of course, all that wine and cheese. I really need to to carve out some time for a stop at Cora now. Thanks for a great preview of this region. Mary, You will absolutely love it. Like I said, we keep going back over and over again. There’s plenty to do, see, and eat! One of my first places to ever visit back in 2002. Absolutely fell in love with this area. Used to live not far away. Thanks for sharing. Loved you drone video too! Thank you. Alsace is one of my favorite places in all of Europe. It’s so charming and welcoming. I love it! Visit Europe's Only Real Fairytale City - Odense!